On our 8th day we woke up and had breakfast in this executive lounge. The view in the morning is beautiful as well. Looking out over the water as we had our lattes and eggs for breakfast, we really felt like we were in a whole new place. Something about bodies of water does that to me. I don’t feel like I’ve truly left home till I can see a landscape of water. Maybe this is due to growing up in Las Vegas. We met our guide in the lobby of our hotel and I can’t stress enough how absolutely amazing she was. 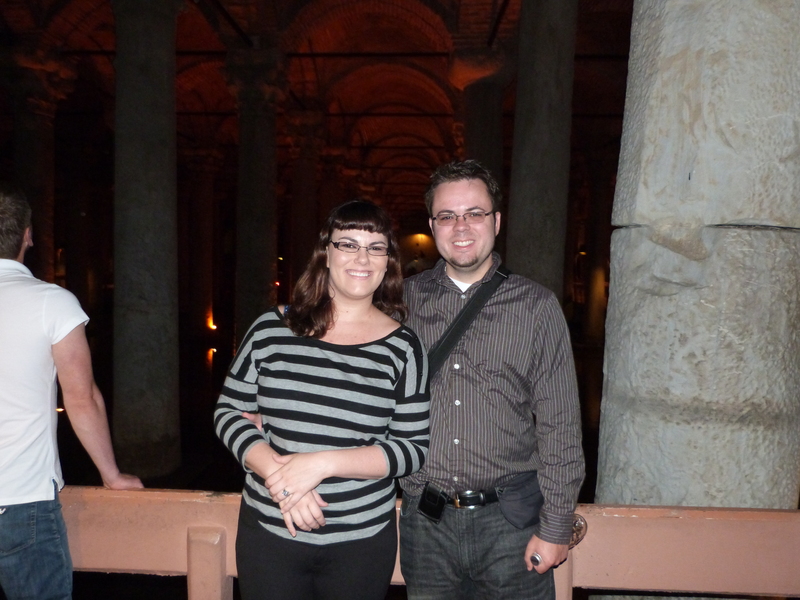 We booked her online through a man named Erol Savda whom we found online doing tours of Istanbul in English. 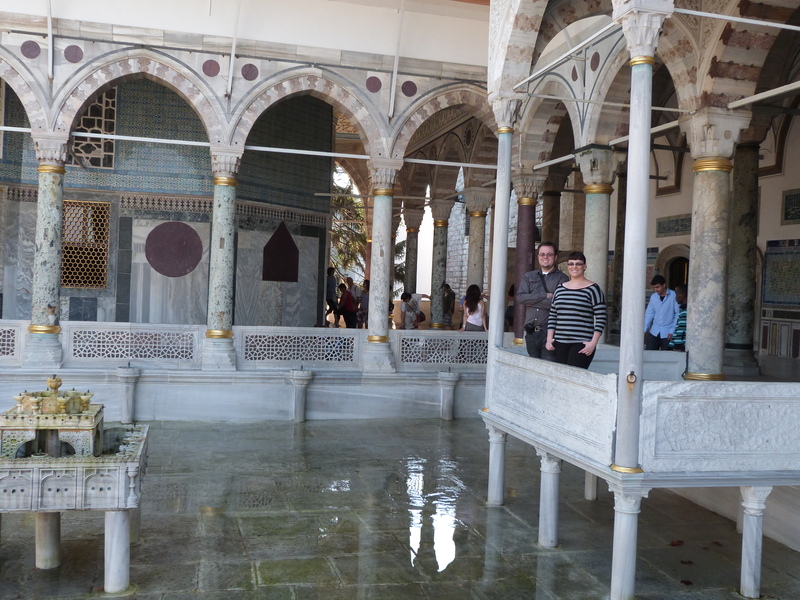 He does tours himself, but was busy the day we suggested so he recommended Sermin Bilgen another tour guide who also works with an organization for women travelers. Seriously, I cannot say enough how much we enjoyed her company and how highly I recommend doing a tour like this one. It was just her and us and she took us EVERYWHERE. 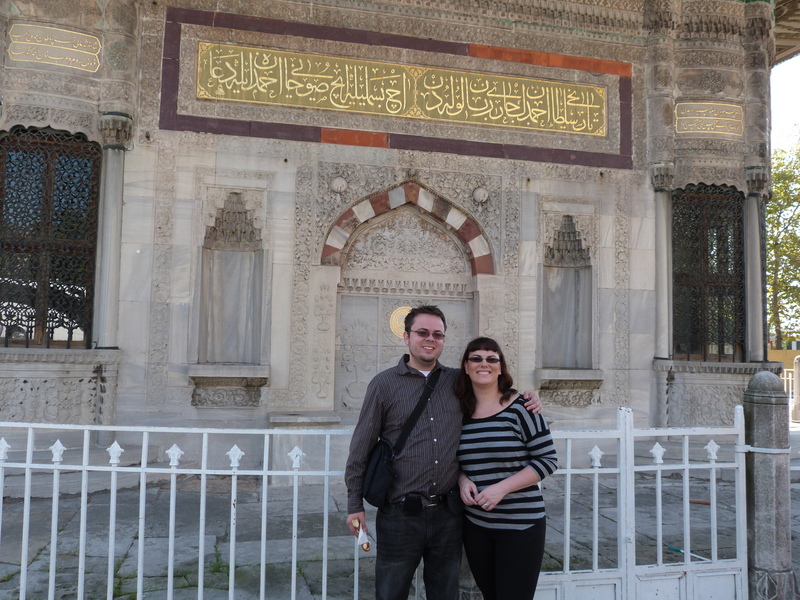 We had her from 9am to 6pm taking us around the entire historical district of Istanbul and all the major tourist sites there for 200 usd cash plus fees for getting into any attractions. 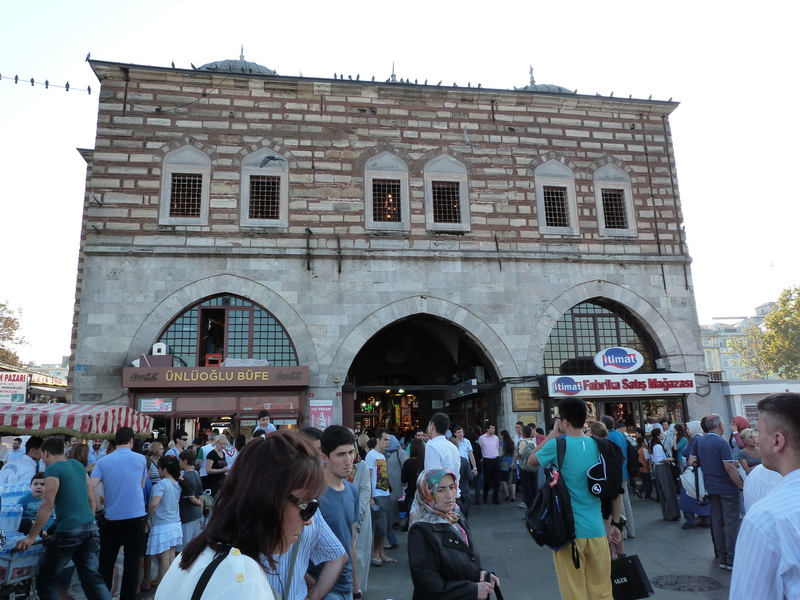 Not only was it extremely useful to have a Turkish speaker with us the first time embarking into the city, as a guide, she goes around all the lines to buy tickets. 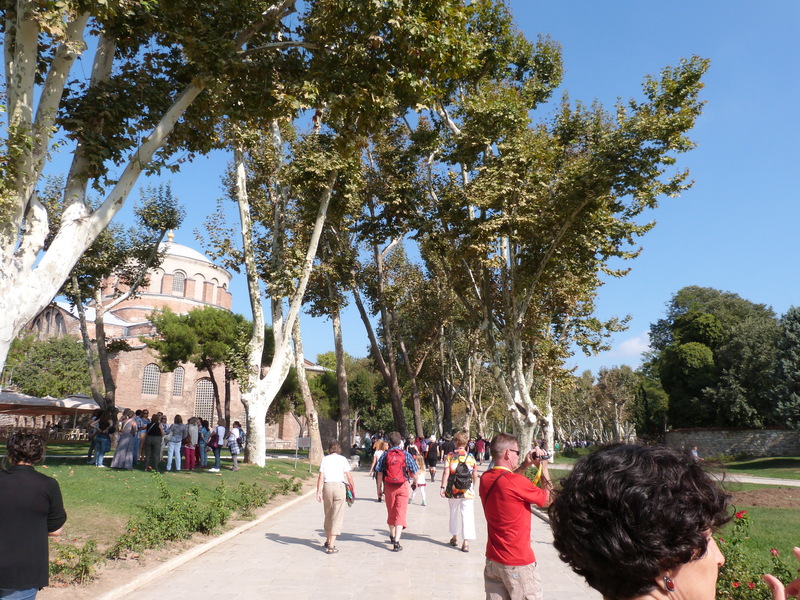 We went around all the other people waiting at the Topkapi Palace for example, which saved a lot of time. Not to mention, I think that they rip you off at a lot of places if you don’t speak the language. So it was extremely nice having her there. Not to mention, she could answer all of our questions, she was so knowledgeable and so friendly. It was just the best day. 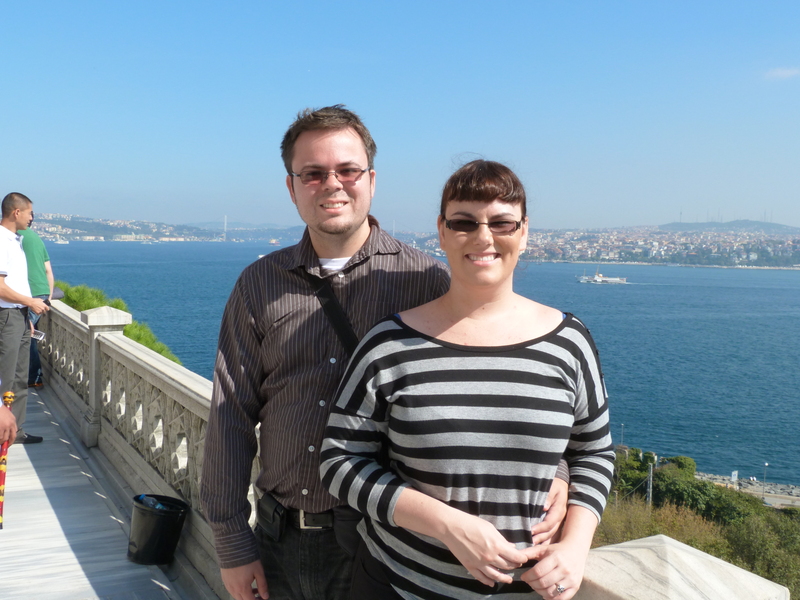 First, she met us at our hotel and we all took a cab over the Galata Bridge into the historic district of Istanbul. 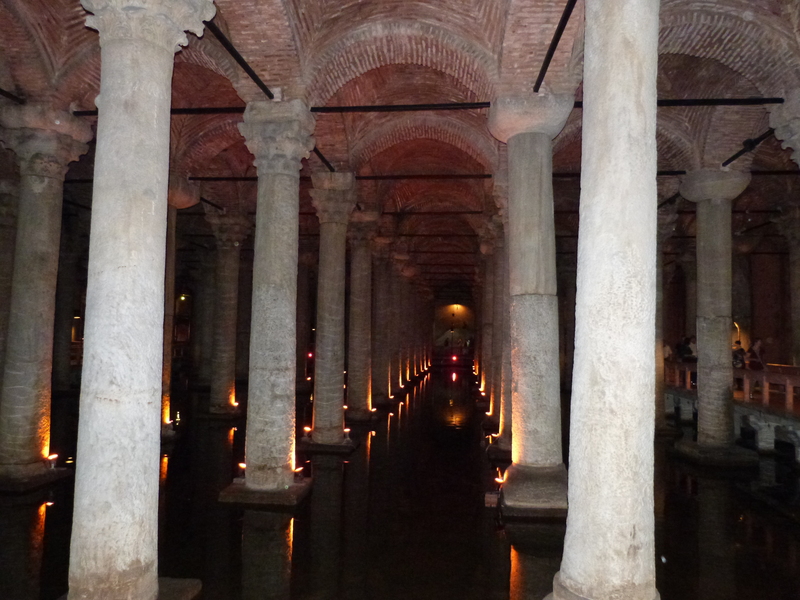 We began at the Bascilica Cistern. 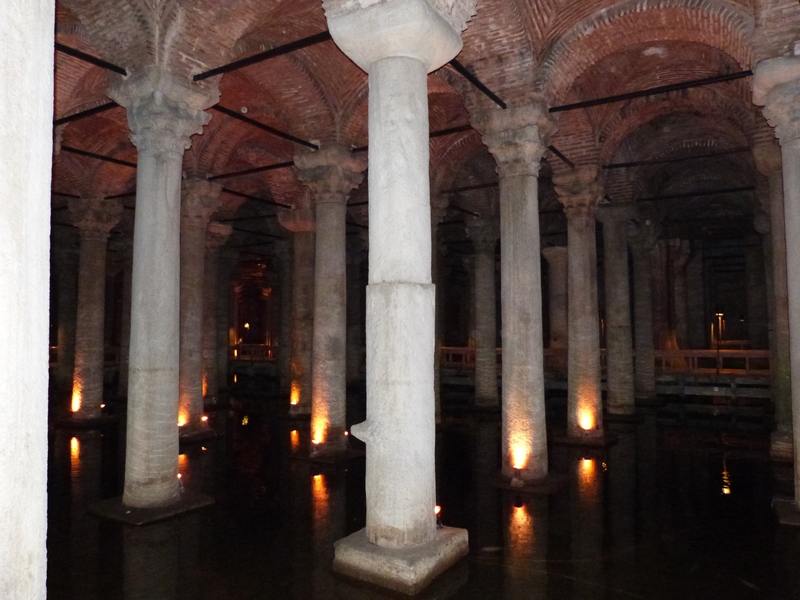 This is the biggest underground places that held water for the palaces built during the 6th Century by Byzantine Emperor Justinian. 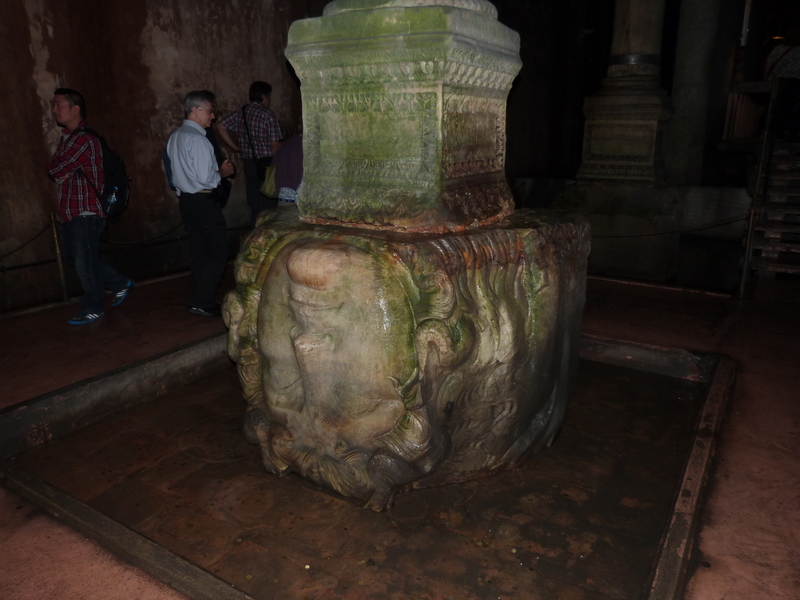 Our guide told us that the medusa heads were put sideways and upside down on the columns because Justinian was so devout. 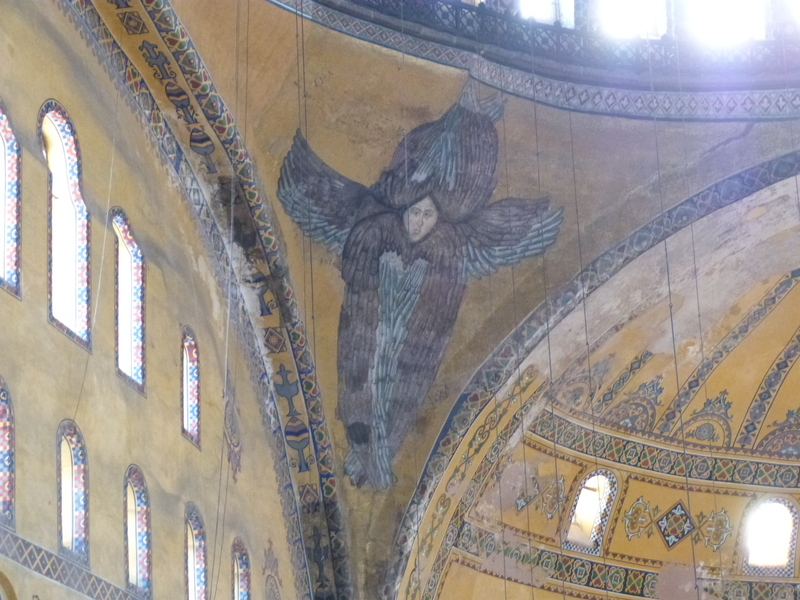 Then we went on to the Hagia Sophia. I hate saying how beautiful these places are because the word doesn’t do it justice. They are incredible. 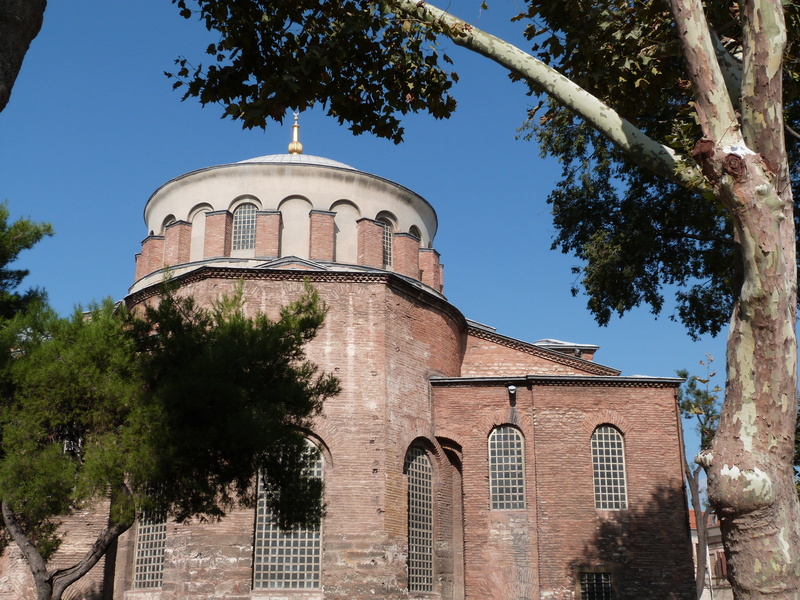 Hagia Sophia was a Christian church and then it was converted to a mosque. 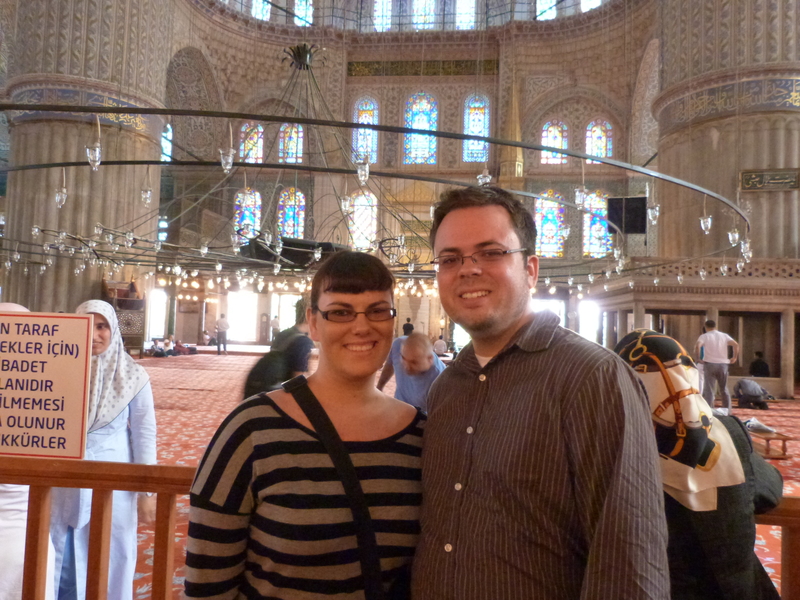 Our guide pointed out the things they added when they turned it into a mosque. 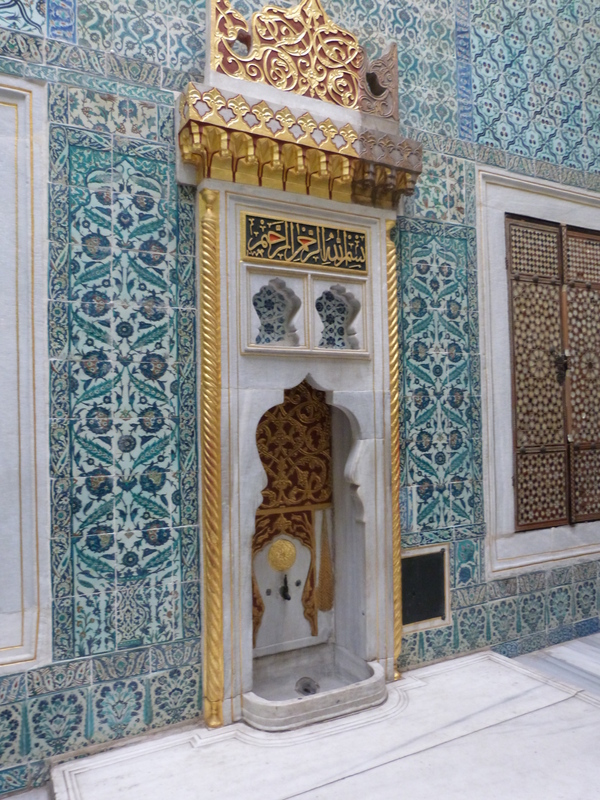 The plaques in the corners with Islamic calligraphy are the largest calligraphy of their kind in the world. 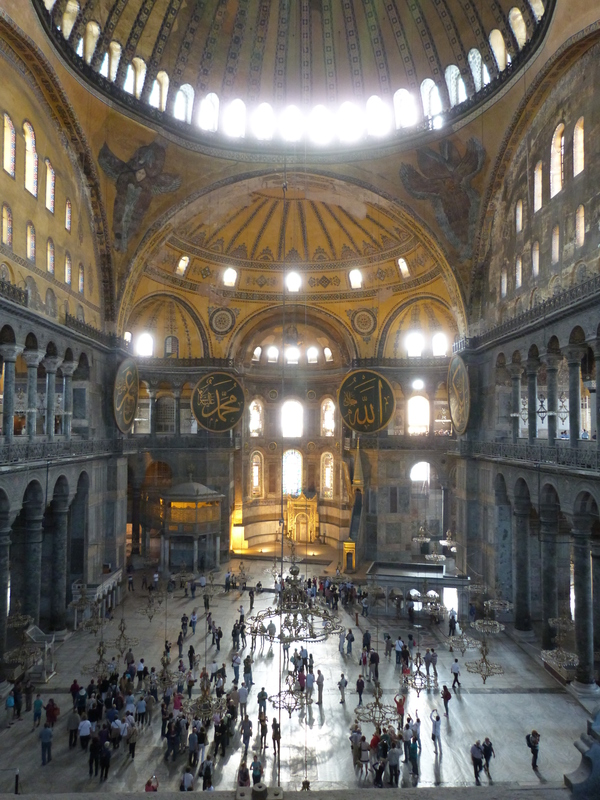 The Hagia Sophia was built three times. 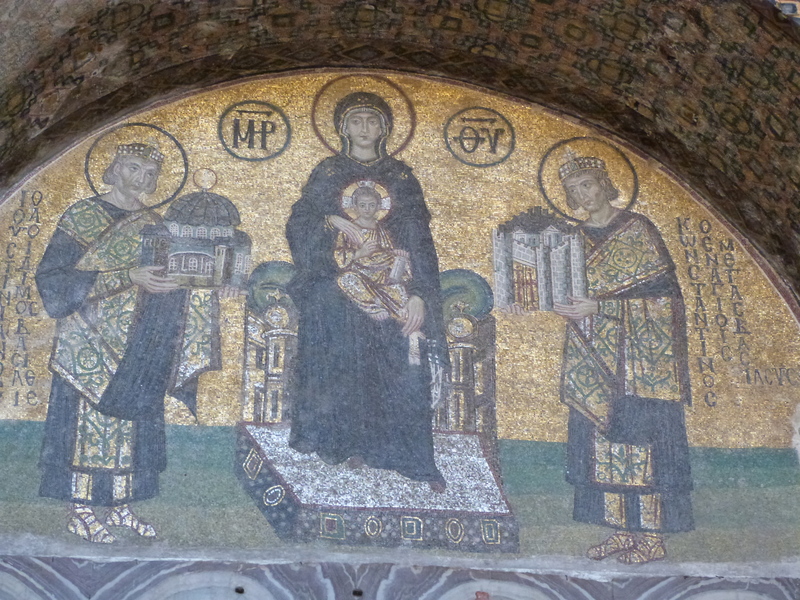 The most amazing, built by Emperor Constantine, has these gorgeous mosaics all over the place. 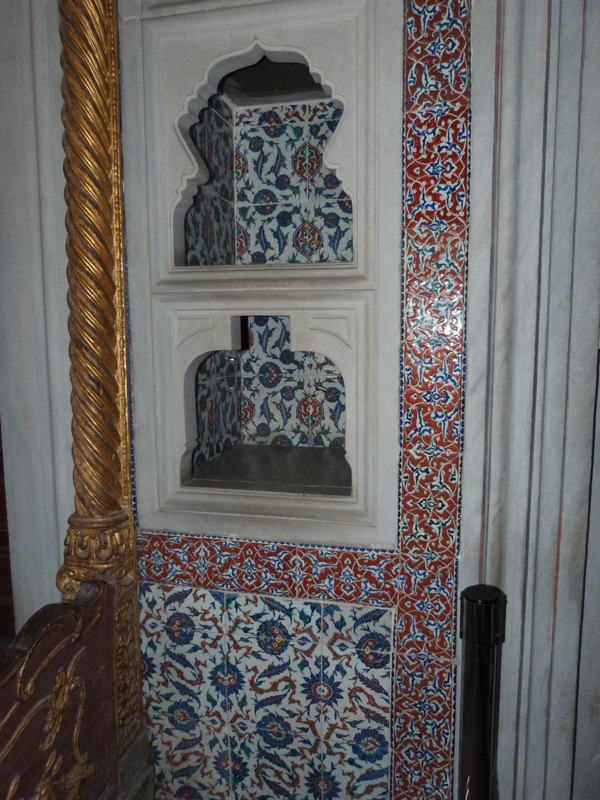 The rest of the palaces and mosques we saw are all tile, no mosaics. 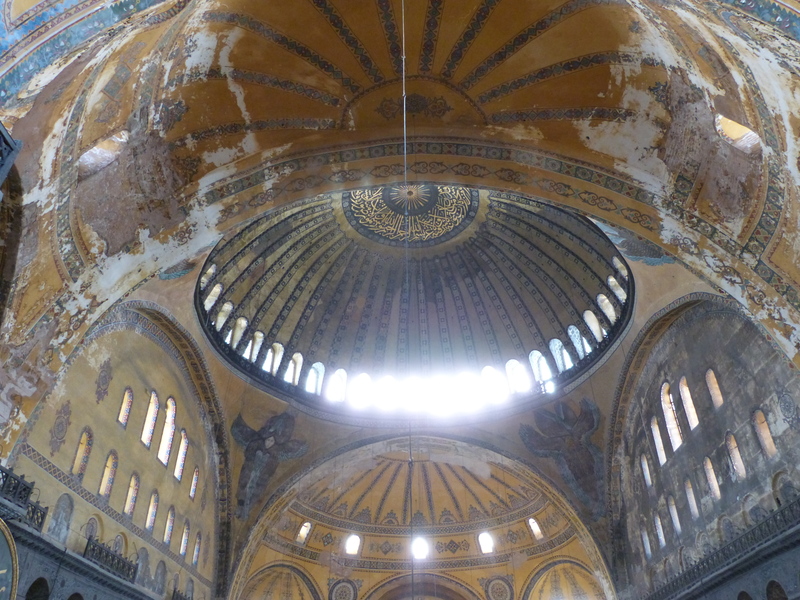 The Hagia Sophia is the place to see mosaics. 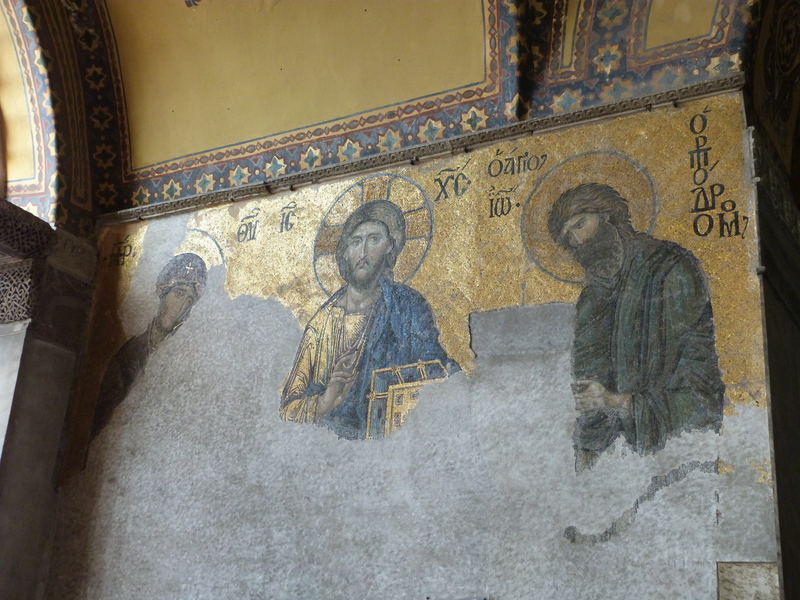 Christians apparently liked mosaics since they are also in the Chora Church, which was saw on a different day. Our guide bought us simit from a street cart and it was very good. She was also kind enough to take our picture all day long at various places. We loved her! 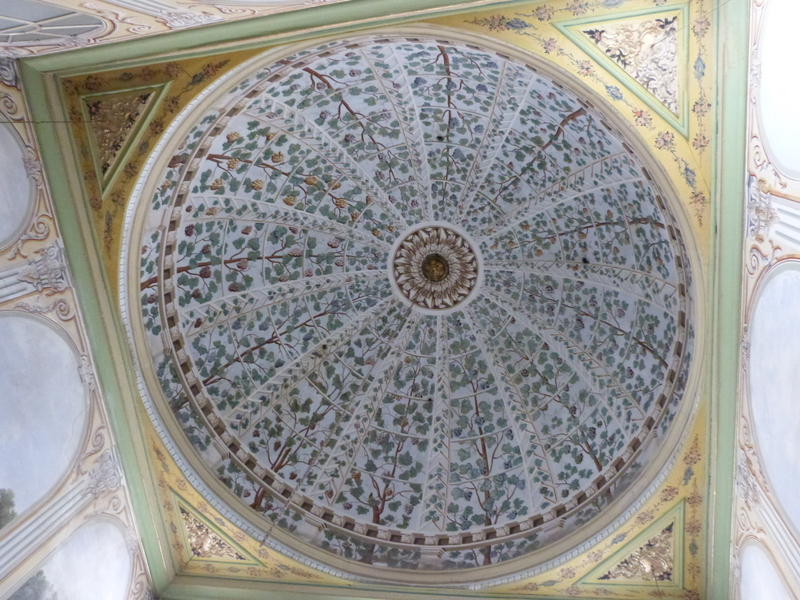 Next was the Topkapi Palace. 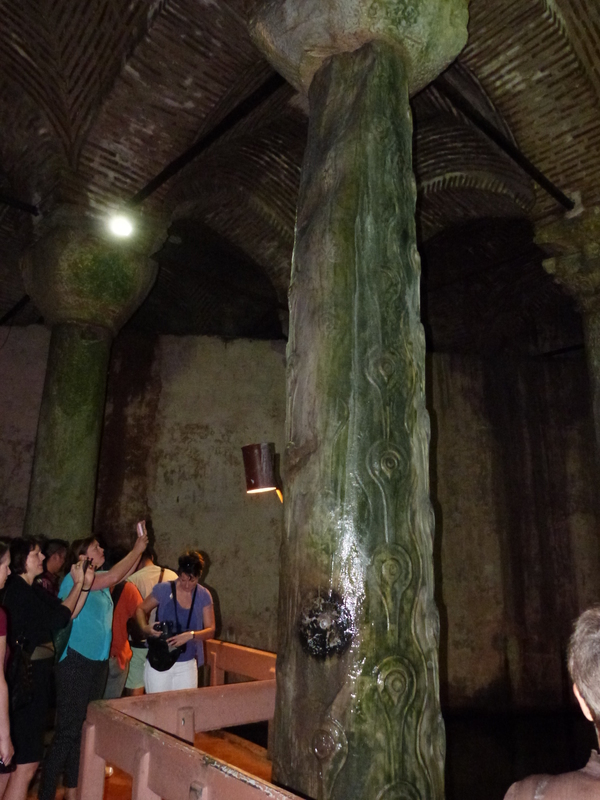 This tour was more historic and we took a while going through all the areas and rooms. The women’s area was a separate ticket and we went through there as well. 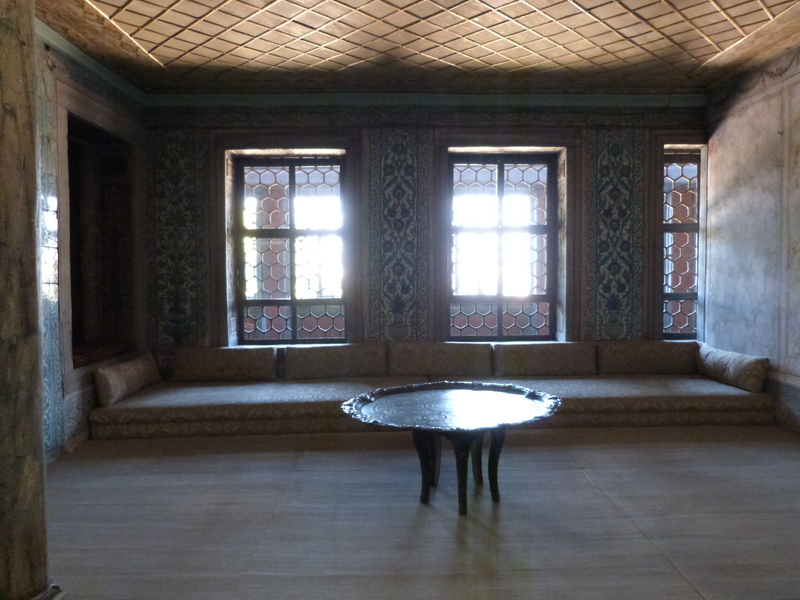 This was the harem where all the women and the heirs lived. A brutal life, I have to say. 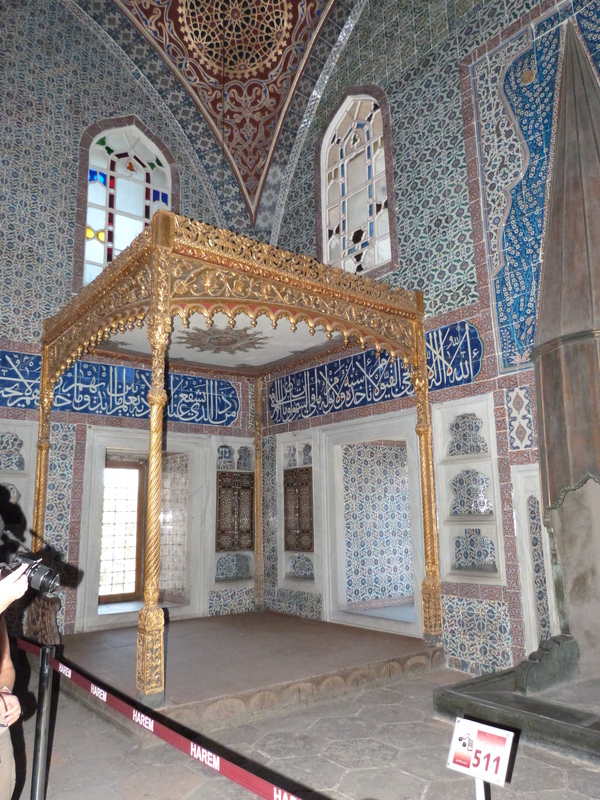 Our guide explained how cutthroat the road was to becoming a Sultan. For a very long time, when one ascended to power, they would murder all their brothers and half-brothers, babies, kids, whatever. It was tradition, so they had no opposition for the throne. The women had it rough too. Being the lowest rung on the power ladder there and getting out after serving your time was literally the best option. 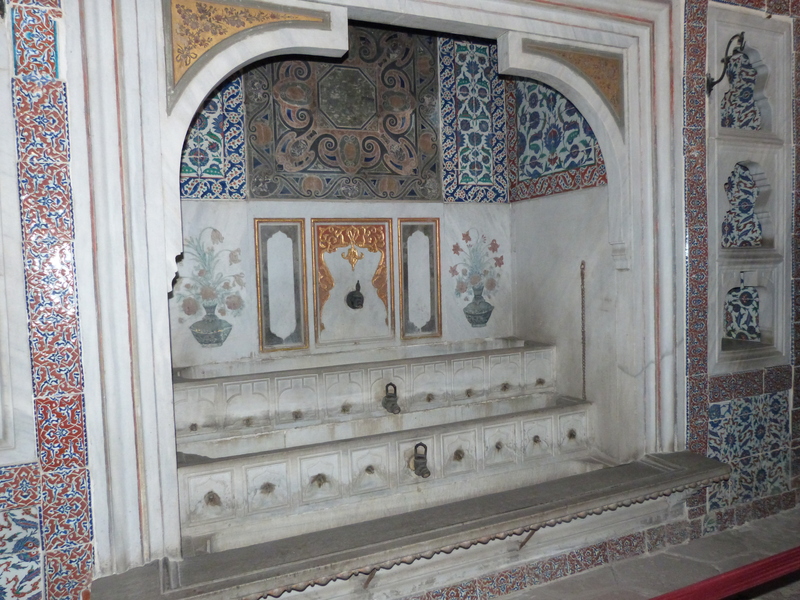 All the women and kids could never leave those little rooms for any reason. I don’t envy that life. Not one bit. 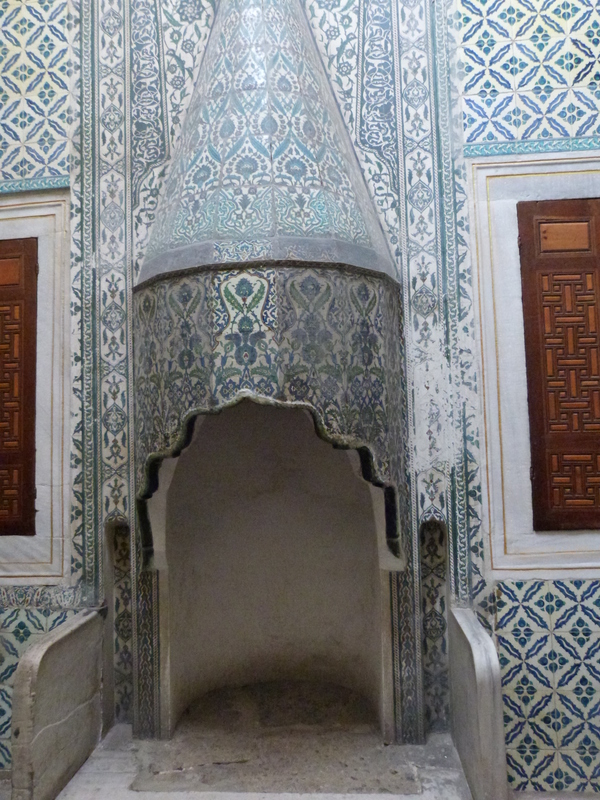 Just look at the turquoise tile! 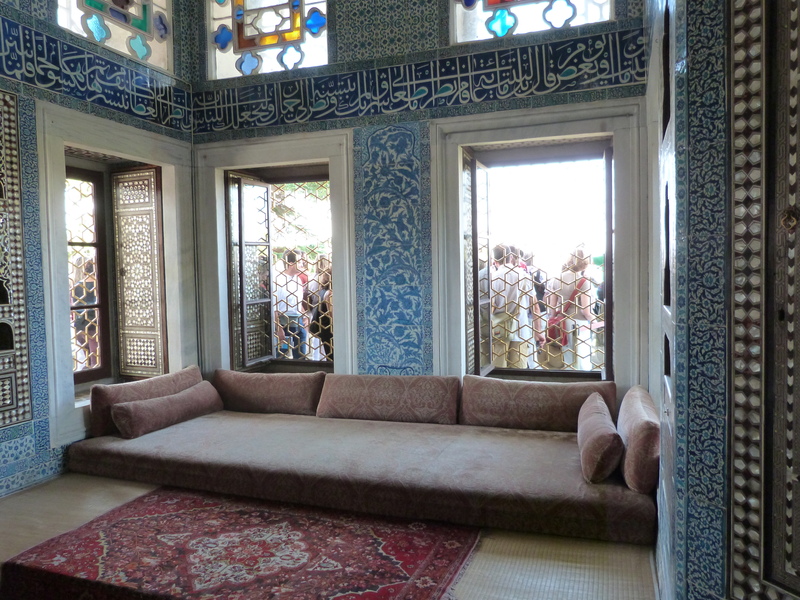 We also saw rooms with gifts to the Sultans including the 5th largest diamond in the world. No pictures were allowed. There were some fancy swords that Muhammud himself was supposed to have owned which was interesting. 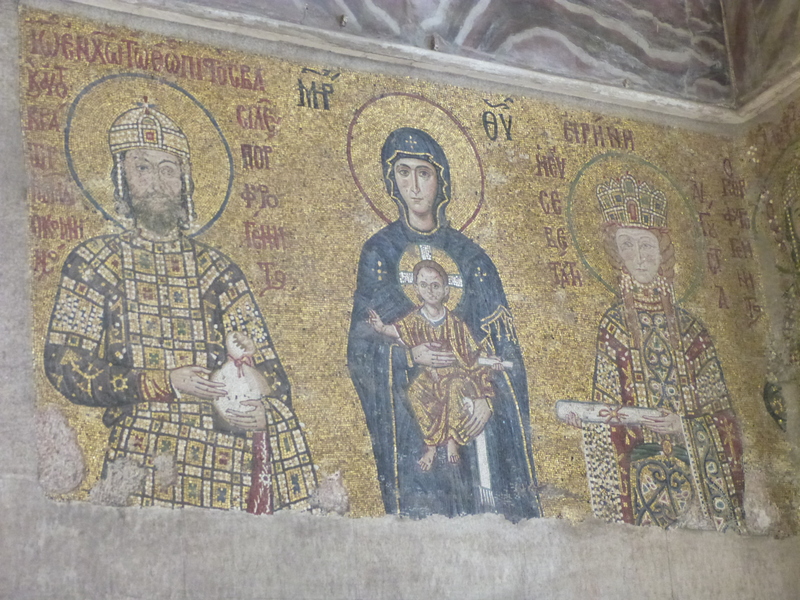 I do suspect that Constantine’s mother was seriously ripped off on some of those “saints bones” she had in jeweled boxes. 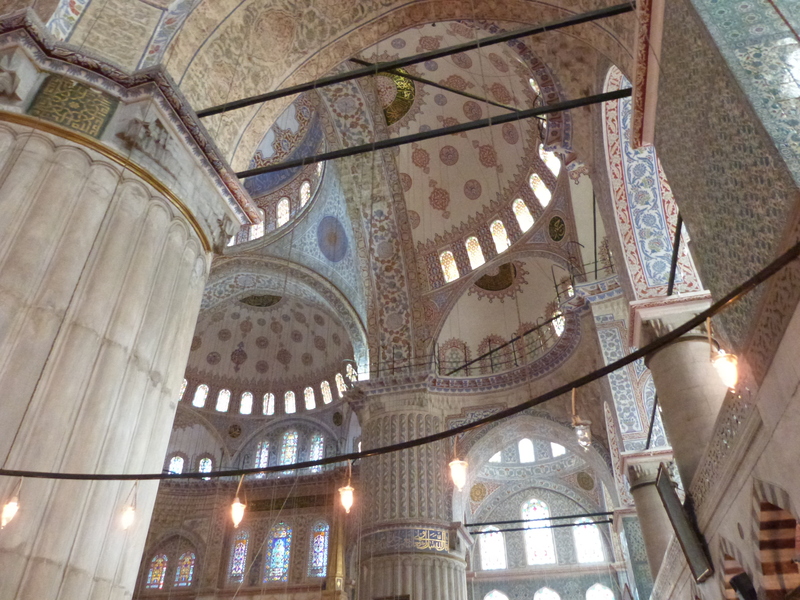 We learned a lot about the Ottomans and Muslim culture from our guide. 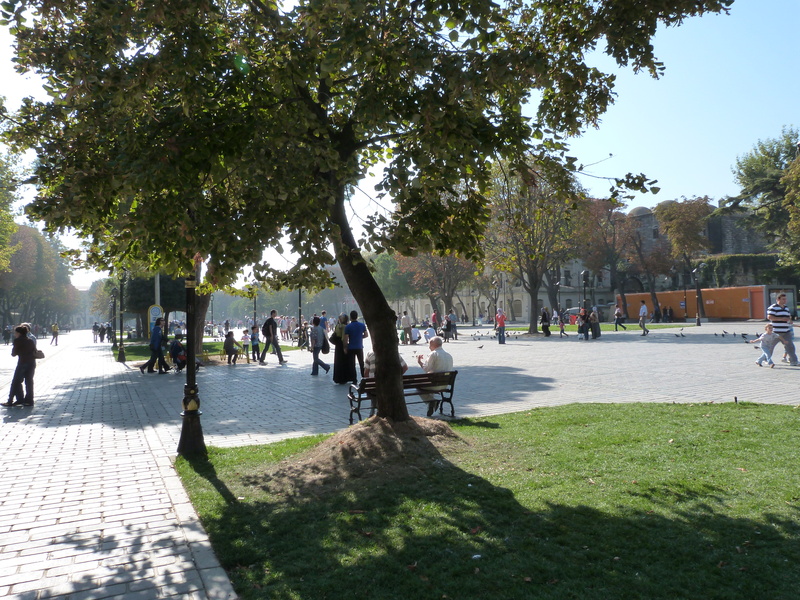 After this long tour, we had lunch at a café in the square between the Hagia Sophia and the Blue Mosque. The food was good, but I was starving! I probably could have eaten three times as much as what we had. We also got some ice cream from a cart beside the café. The guy did tricks with the ice cream as he scooped it which was cute. 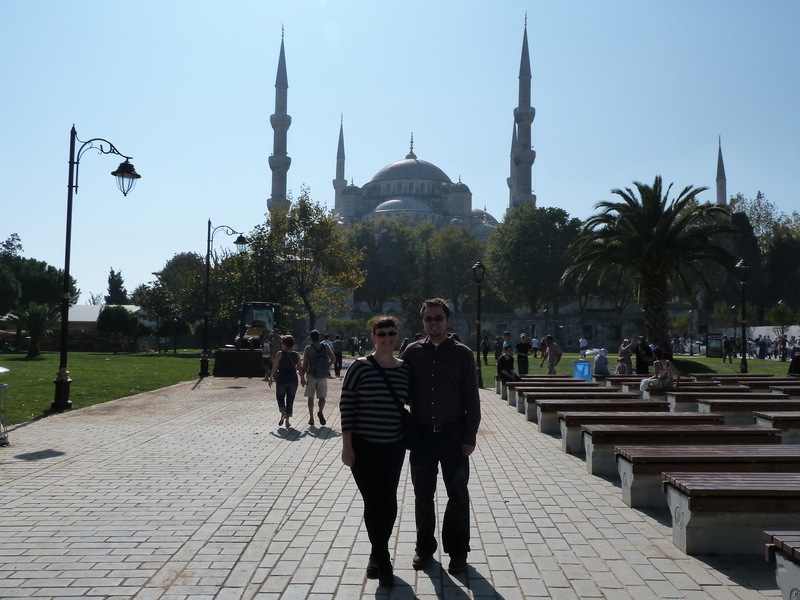 The Blue Mosque was next. This did not take very long at all. I was surprised to learn that these giant, crazy cool, tortoise shell shaped buildings are all really just one large room on the inside. 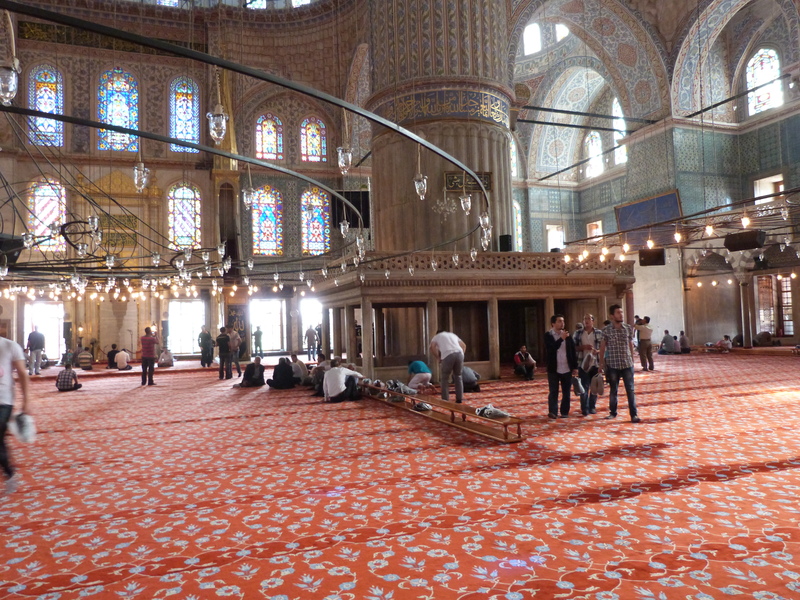 I had never been in a mosque before, so I suppose I started at the best, lol. 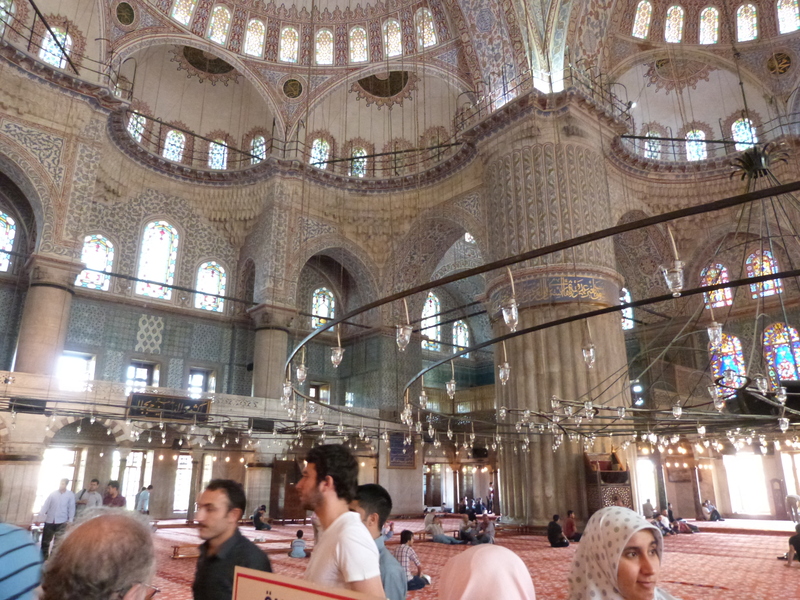 The Blue Mosque is simple to get in, you wait in line outside, take your shoes off and put them in baggies and walk in barefoot. They provide scarves for women to put on to cover their hair but don’t make you do it. This is funny to me actually because I grew up in a household where we never wore shoes in the house. My husband and I do not wear shoes in our home either. Taking your shoes off makes complete sense to me! I was completely comfortable. 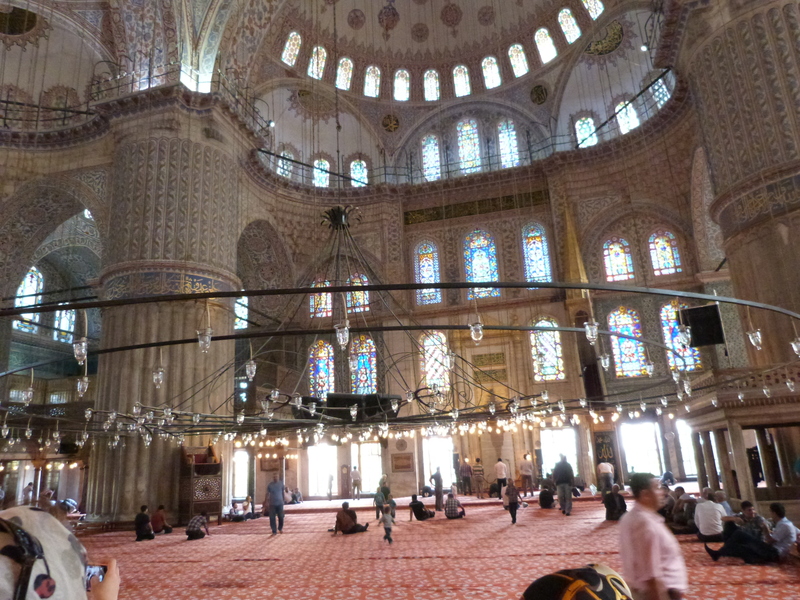 Our guide explained as we entered how the mosque is sectioned off between men and women, men get to be on the floor of the mosque and women are higher in the upper levels looking over the area. Some men were praying and lot of little kids were running around on the worshiping side, playing. 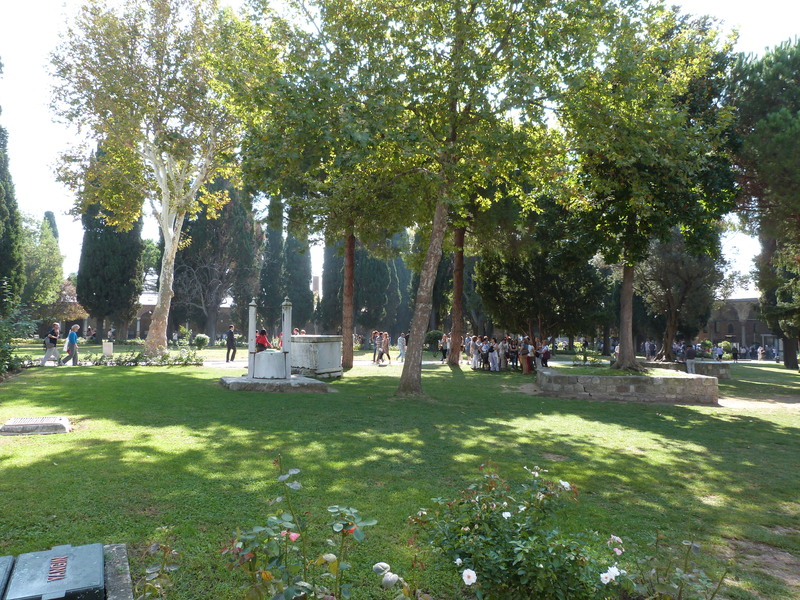 They separated the tourists from that side so we wouldn’t disturb, though not much was going on at the time. We stayed standing and taking pictures in the big room for a while. I’ll let them speak for themselves since I don’t have the words to describe that breathtaking place. Oh I will say one thing. 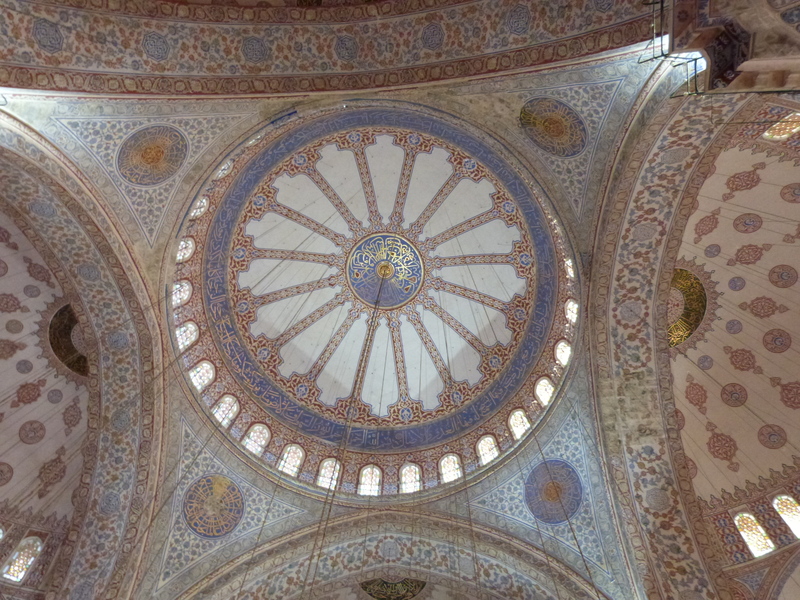 Comparing it to the churches I’ve seen, it was so much more alive with light and color. 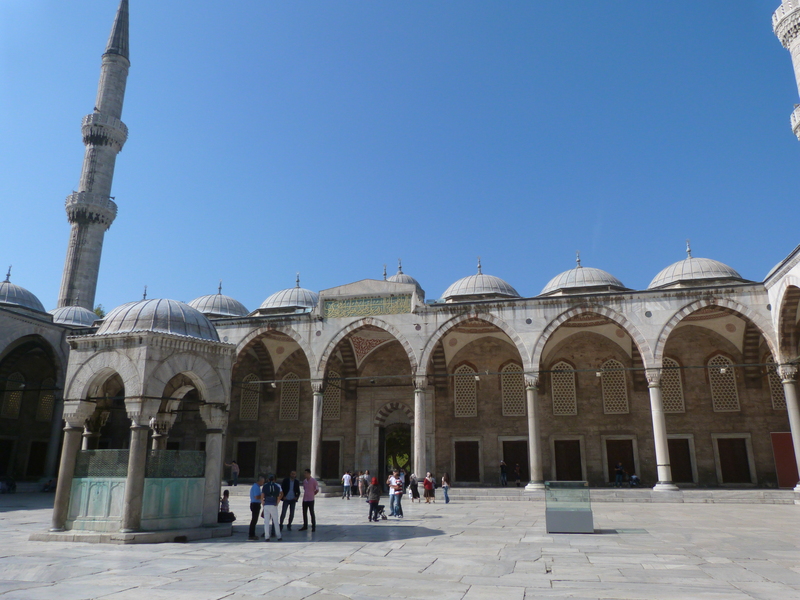 Our guide said something about it being a more joyous place of worship because the Blue Mosque is so bright and clean and pretty with light blues and white. So cool. 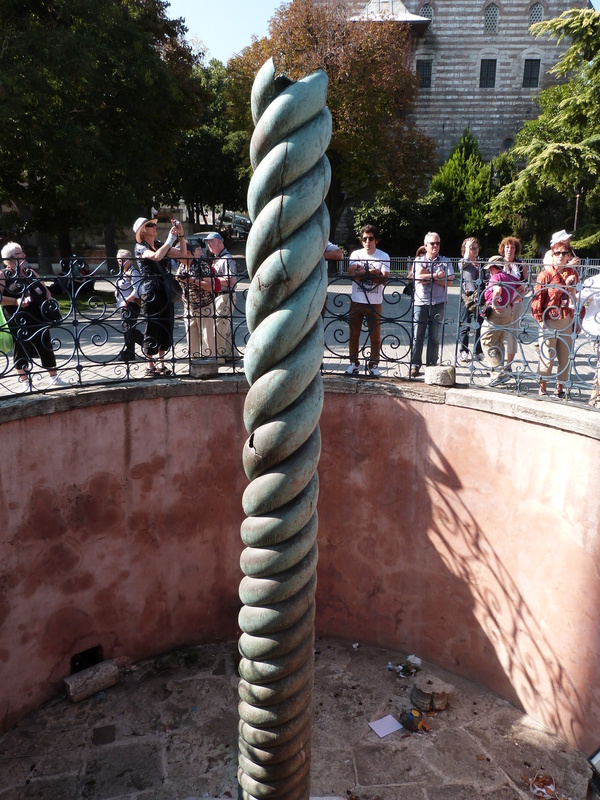 After, we walked at the Hippodrome square and saw the German Fountain, so-called as it was a gift from a German, the Serpentine column, and a column from ancient Egypt. I think they did this a lot back in the middle ages. 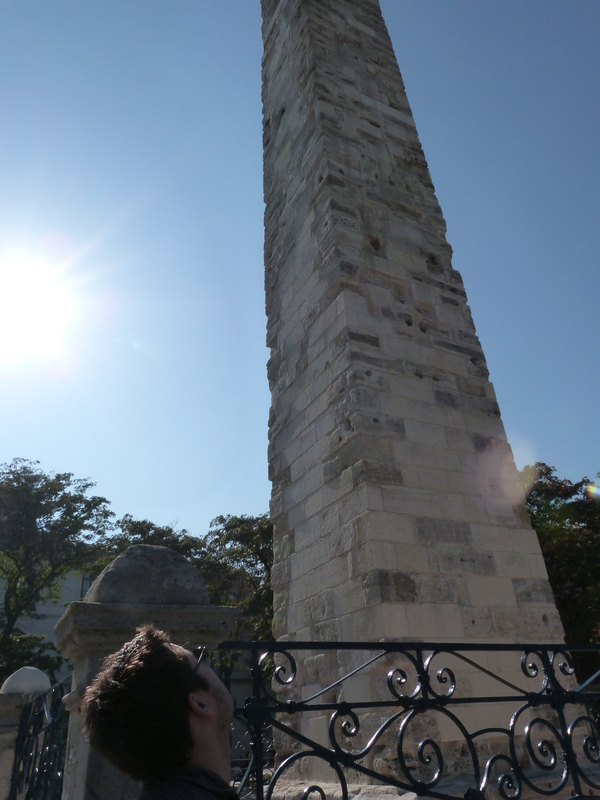 We saw an ancient Egyptian column in the middle of Paris too. 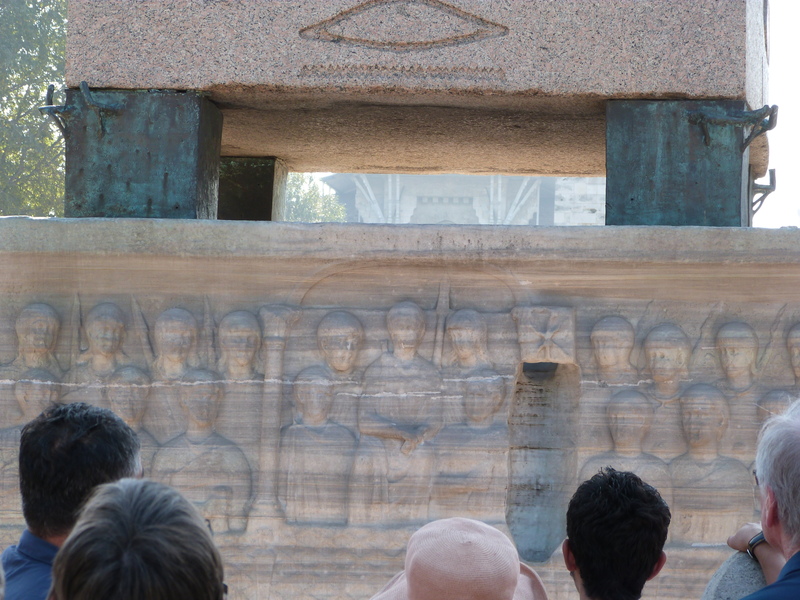 This one’s base was carved with figures depicting the splitting of the Roman Empire. 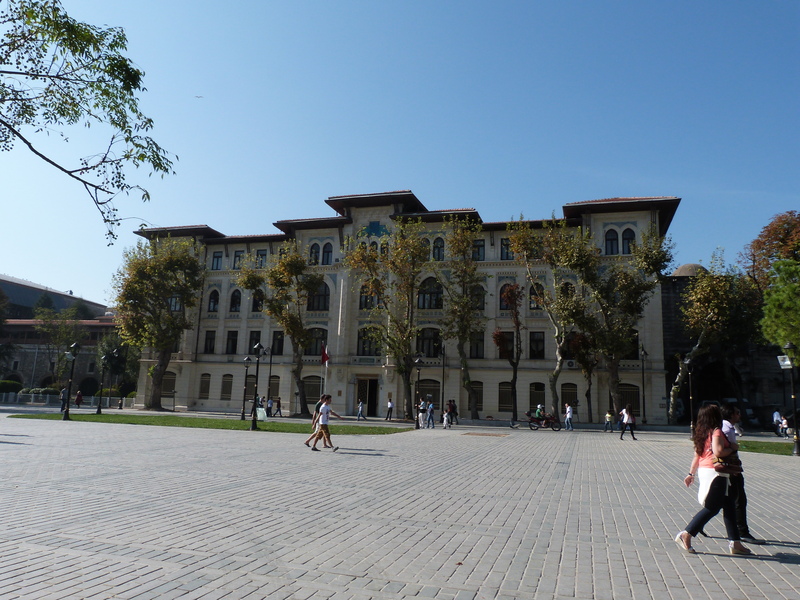 The older building in this square is the old Vizier’s palace and is a government building now used for land deeds. 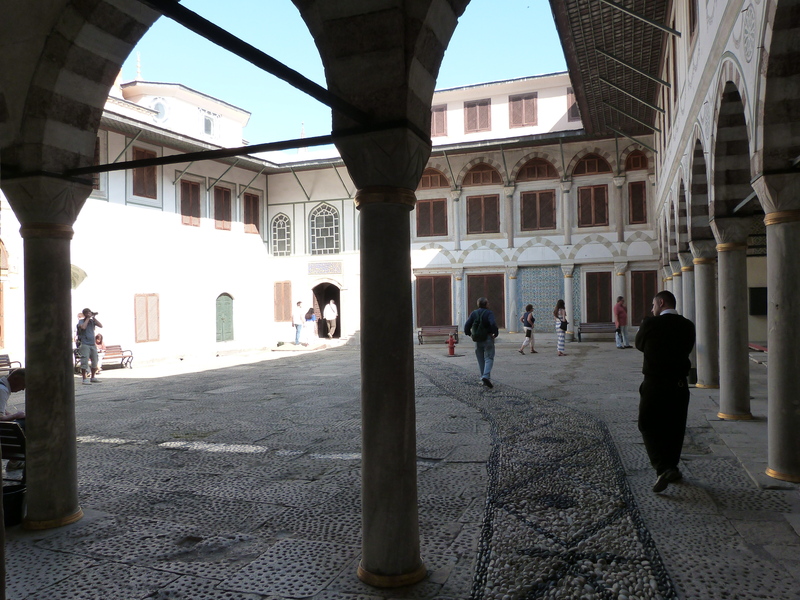 Then, just at the turn of the cobbled street around a corner and down a small hill was the carpet shop. 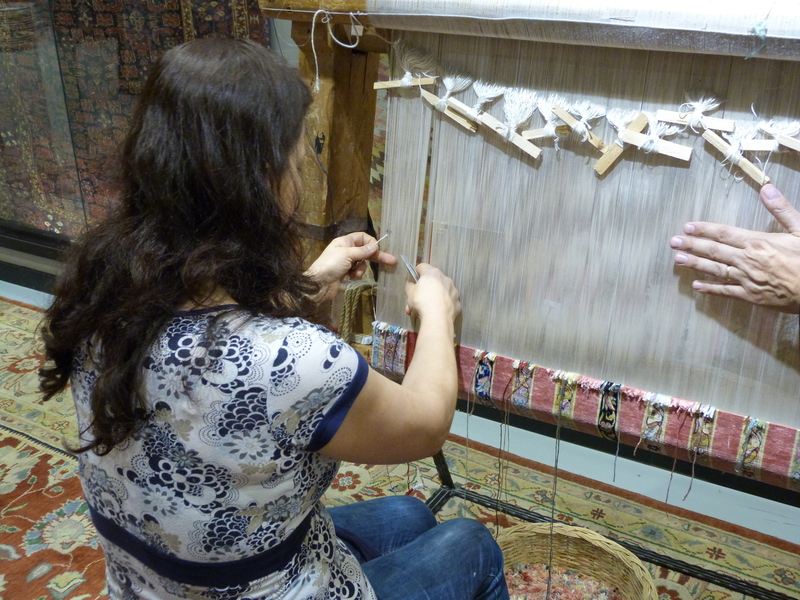 Our tour took us on a stop at Nakkas Oriental Rugs and Textiles. 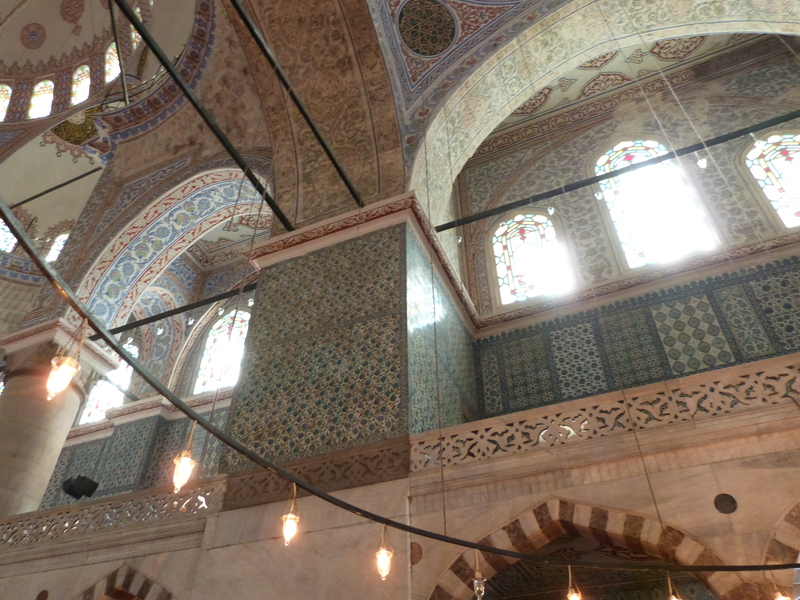 They are a high end store that sells Turkish carpets, jewelry, and ceramics. 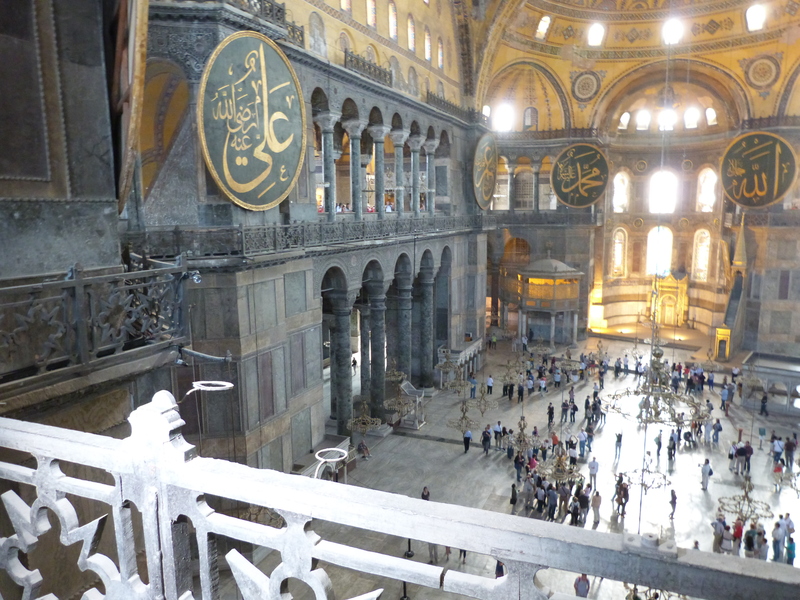 Now I knew that I wanted to buy something truly special in Istanbul. 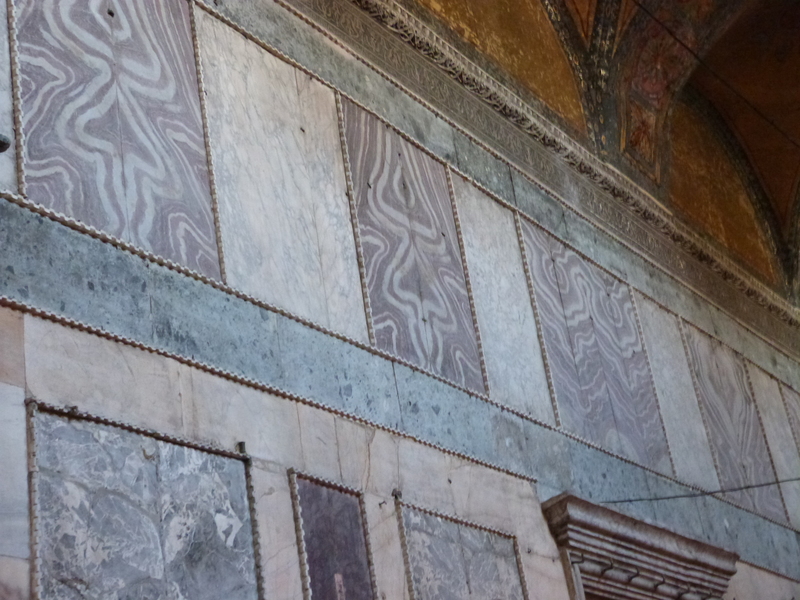 At least one really great souvenir, but when they showed us the 100% silk Turkish carpets, one barely bigger than a placemat for $980, we were glad to have bought our carpet souvenirs in Greece. Just one wool rug of average size at this place was $600. You might be thinking, why not just go somewhere else to buy them? 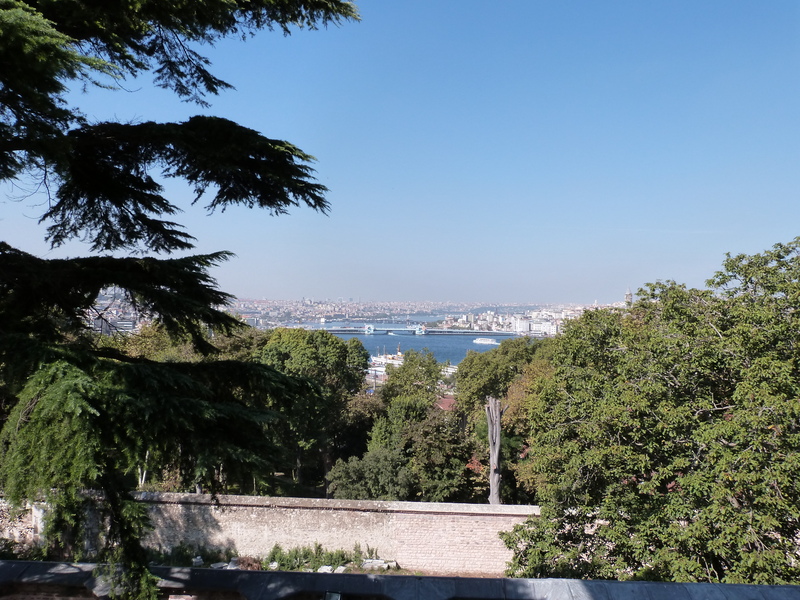 I would say we did look around a lot during our stay in Istanbul, but when you are spending that much money, you have to either have a really good feeling about the place (as we did in Greece) or have a recommendation and go high end. This Nakkas place was recommended by our guide and high end, but we did not buy that day. 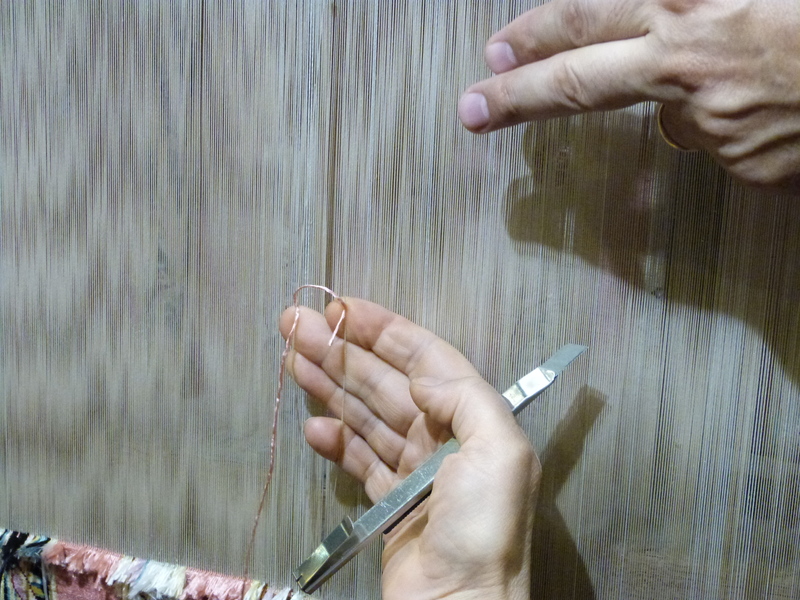 They demonstrated the Turkish double knot loom technique and that was really neat. It was a very nice place. 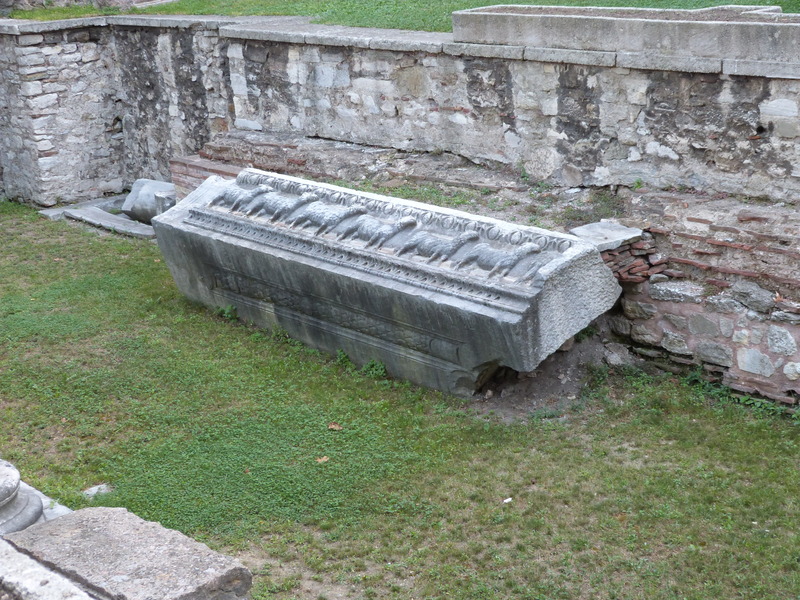 Nakkas is actually built over another cistern they found fairly recently. After, we took a cab to the Spice Market. The tour was supposed to take us to the Grand Baazar, but it was closed that day. 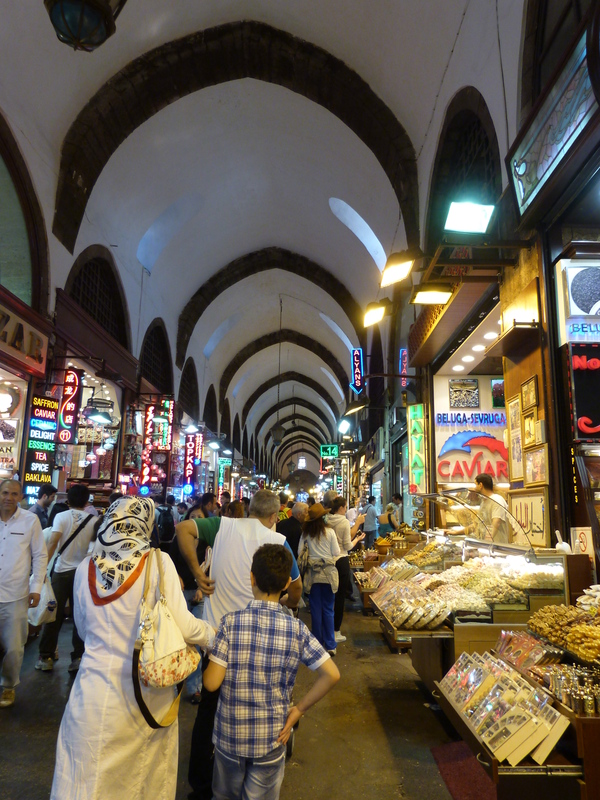 Anyway, I am so glad to have gone with our guide to the Spice Market. This is actually a place you can find good things to buy. 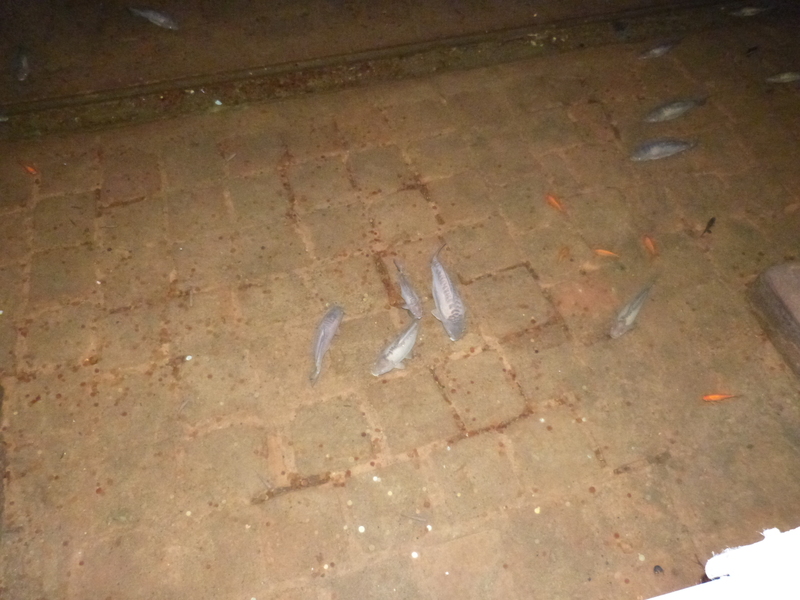 Everyone told us absolutely do not buy from the Grand Baazar anyway. More on that place later. The Spice Baazar was really neat. 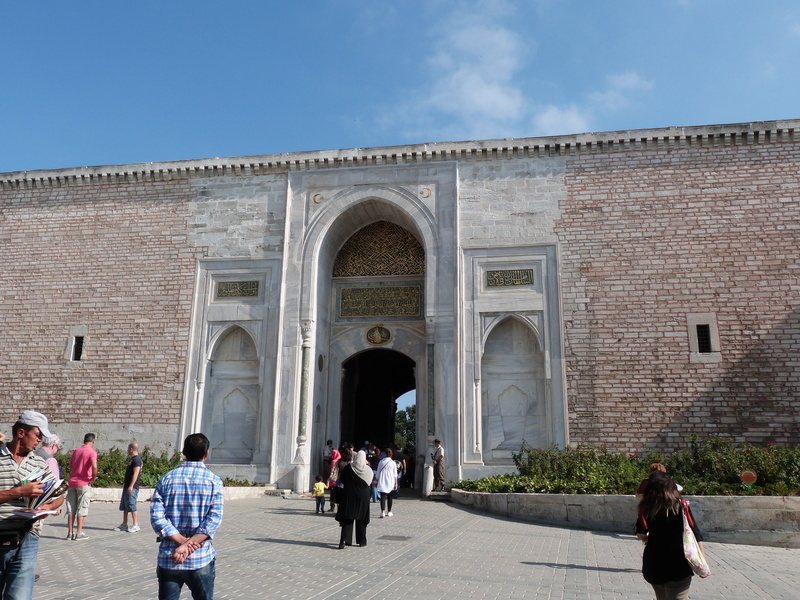 The entrance is in a square next to the New Mosque by the water. 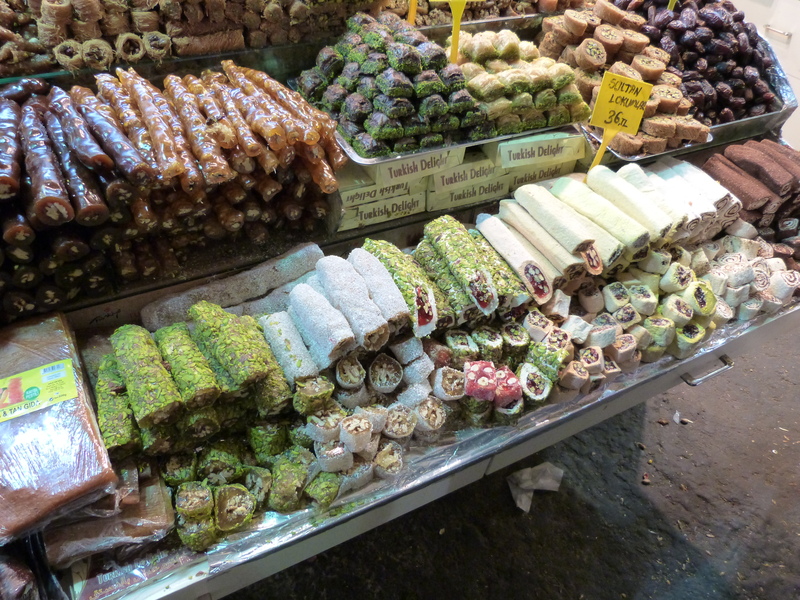 She took us to a few stalls where she used to buy from when she lived closer to this area and to her favorite baklava place in the whole city. We bought a giant brick of it and she bought some too. 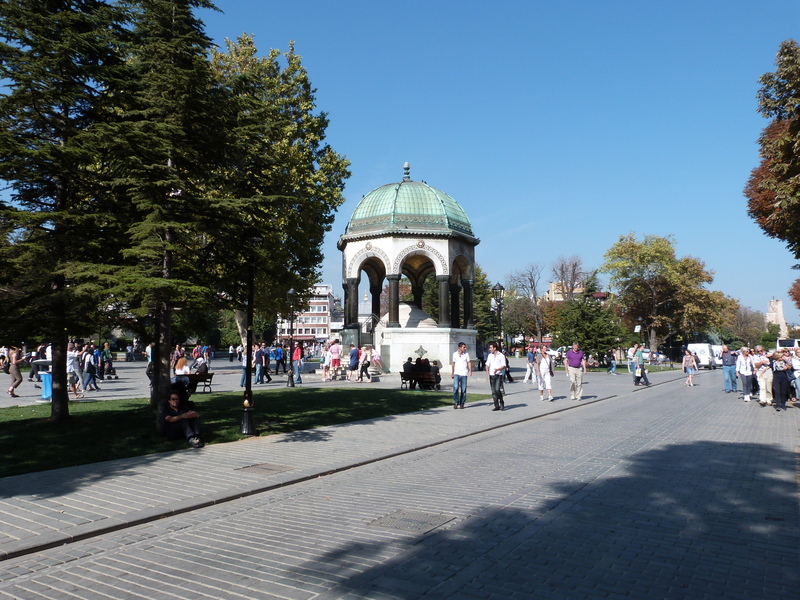 From there, we walked to this perfect old time candy place that makes Turkish delight. 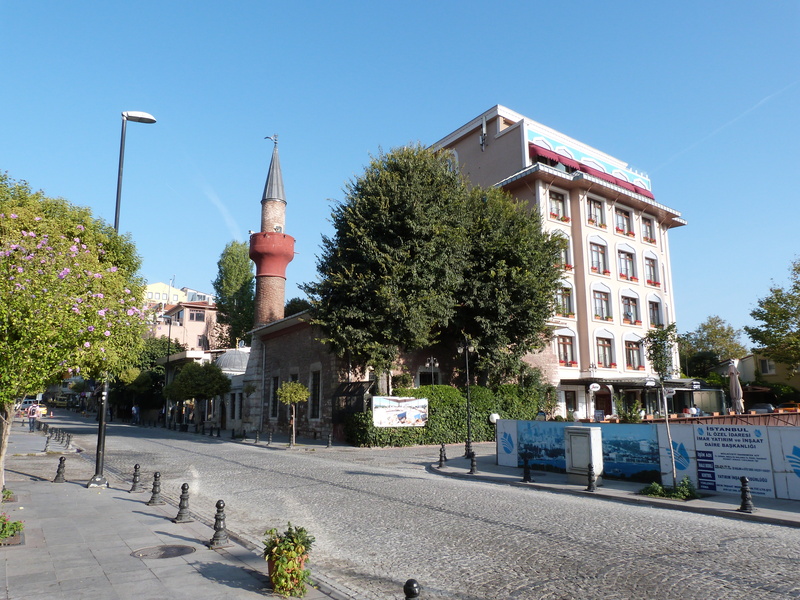 The location she took us to was the original location of Haci Bekir’s. They have been at this location since 1777, they are almost as old as our country! Not to mention, they are apparently the reason Turkish delight has the jelly texture today. It used to be made with different ingrediants, but they improved upon it. I was extremely excited to find this place as this store would have easily been there for my characters in the book! 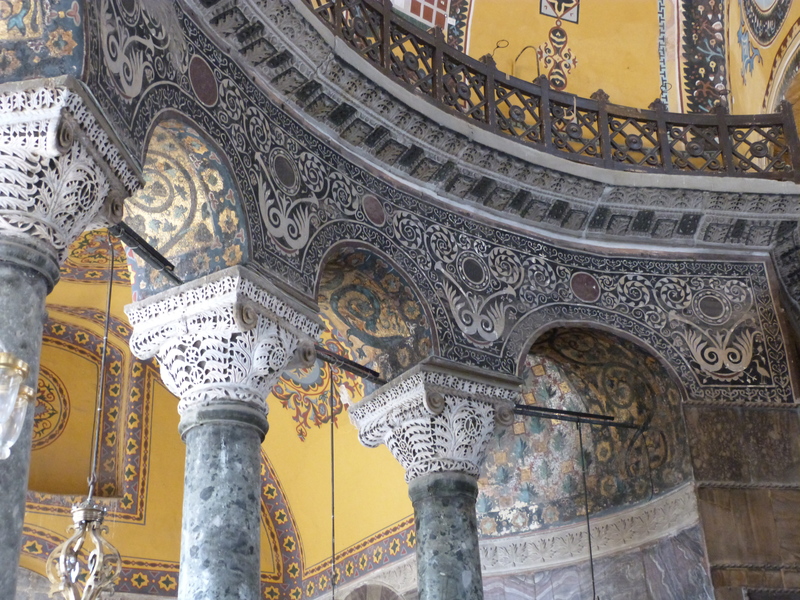 I am absolutely planning on using this location in my novel and we made plans to go back and buy more Turkish delight before the end of our stay. 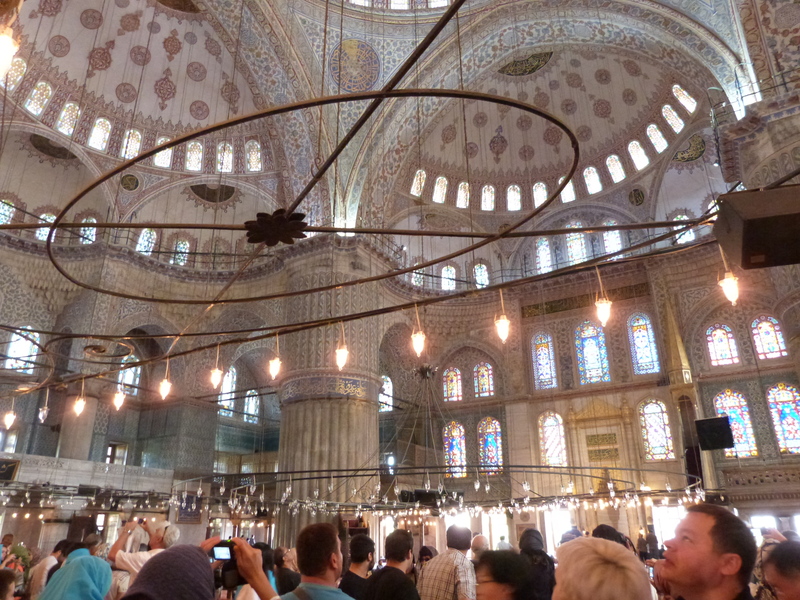 Our wonderful guide fit in another mosque from the candy store. None of this was on the tour, but she added as we asked questions. 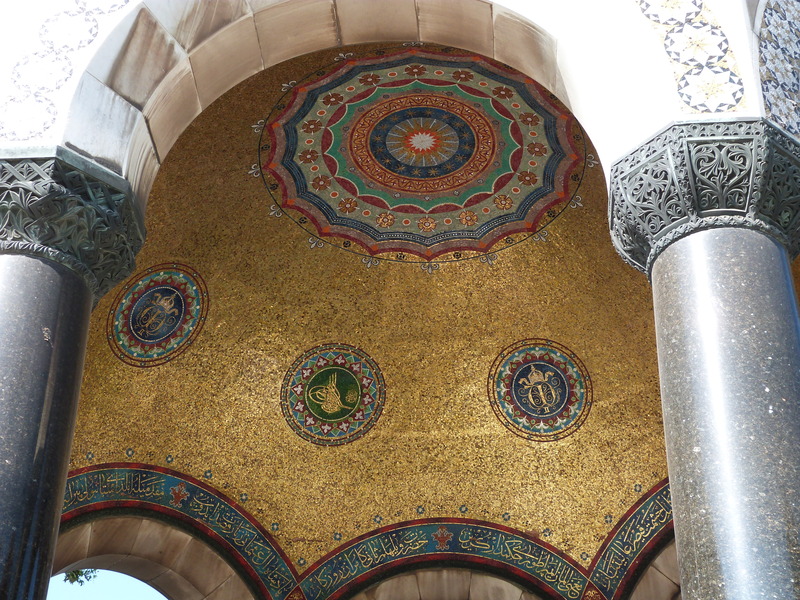 This mosque has the best preserved tiles. This was smaller and had barely any people, but someone at the door made me put on a headscarf anyway. 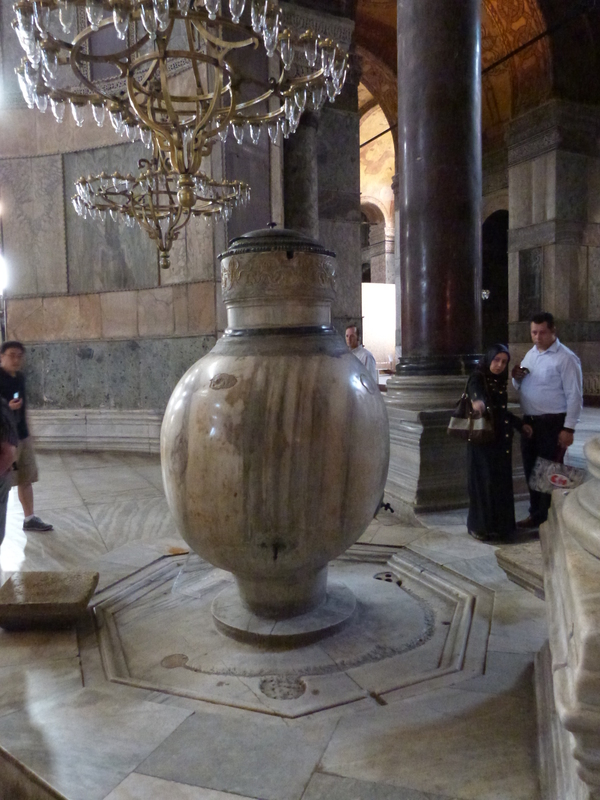 They didn’t even do that at the Blue Mosque, which is funny. Chris got a kick out of it and took pictures of me. 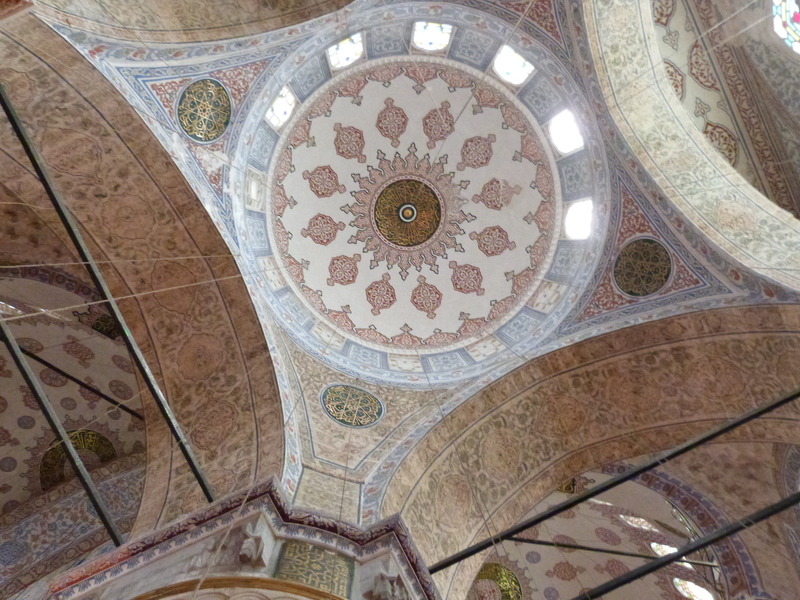 I took a video of the mosque with my iphone. 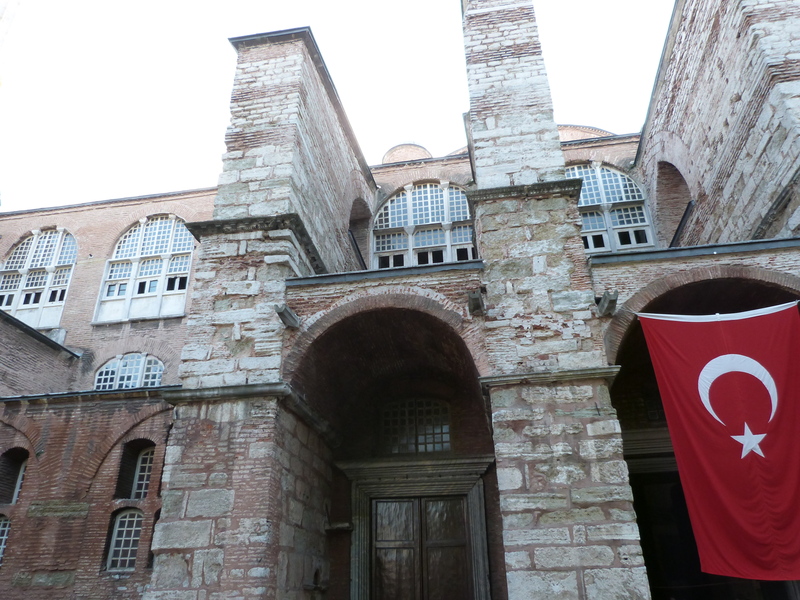 This mosque was the Rustem Pasha Mosque (she wrote it down for me, but some of the letters don’t transcribe to English. 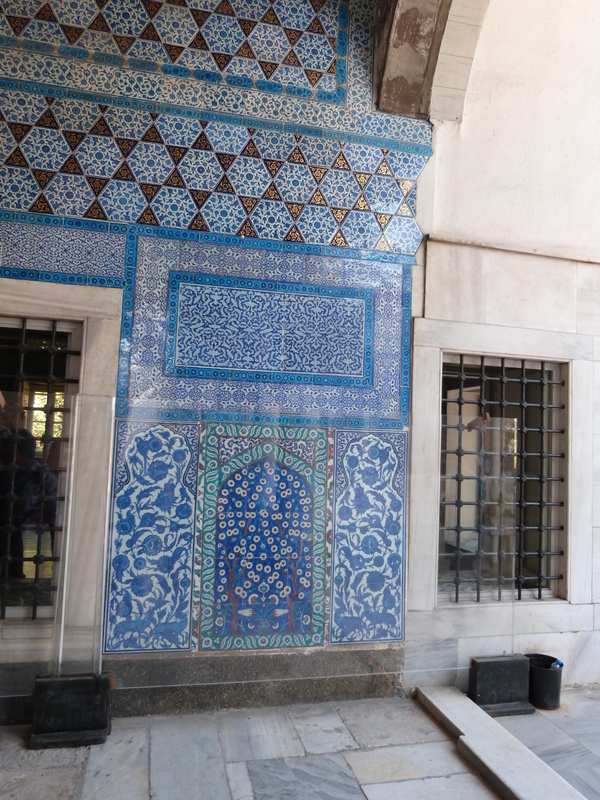 The turquoise tile work is something the Turks came to be known for. 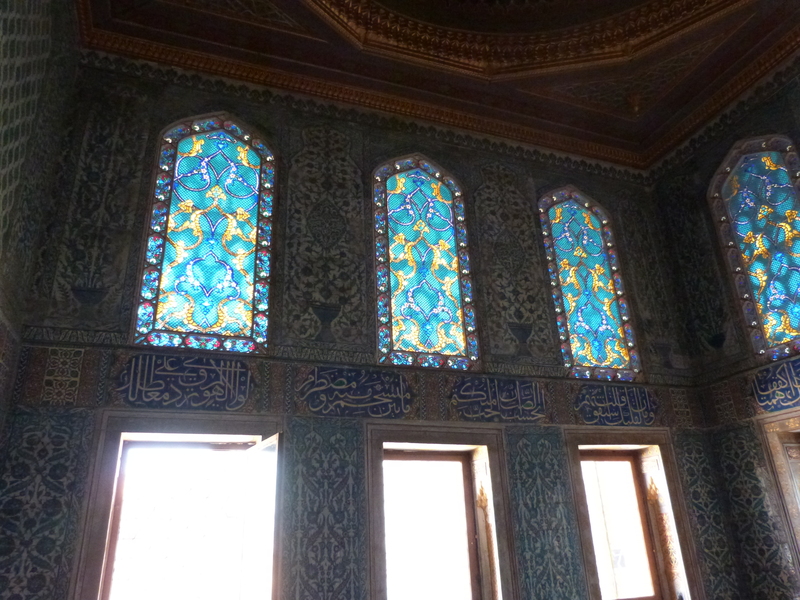 They liked the color so much, turquoise is derived from the word Turk. At the end of the long day, our wonderful guide dropped us off at a nice authentic Turkish restaurant overlooking the water right next to the Spice Baazar known for its good Turkish food. 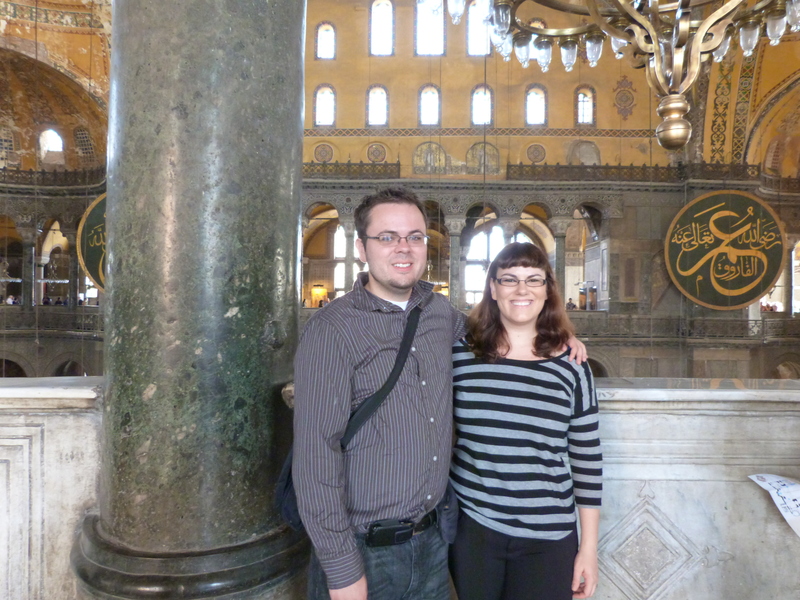 She had to go, but gave us a whole list of places to check out while we were in town. We had great food again, of course and then caught a crazy expensive cab ride (30 lira seemed the going rate once a cabbie found out we were staying at the Hilton, dammit!) back to our hotel. 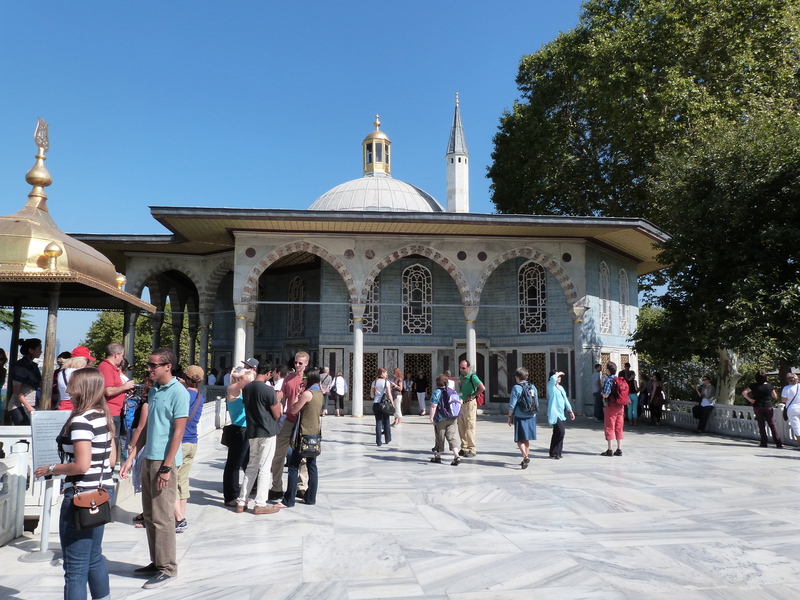 This entry was posted in Our trip to Europe and tagged Blue Mosque, Europe, Hagia Sophia, Istanbul, Spice Baazar, Topkapi Palace, travel, trip.